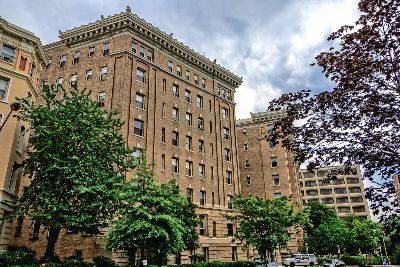 The Wyoming House is a stately Beaux Arts condominium that can be accurately described as being in two of the most popular neighborhoods in Washington, DC—Adams Morgan and Kalorama. These reason for this duality has to do with the building’s street address at 2022 Columbia Road NW. As it turns out, Columbia Road is considered to be the borderline between the two trendy enclaves. So which neighborhood is it? Given that the structure was written up in the Washington Post as being in the Kalorama Triangle, we will defer to their judgment. 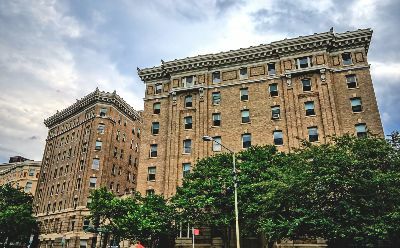 The grand former apartment building is listed in James Goode’s “Best Addresses” and has been home to numerous political figures over the years, including Dwight D. Eisenhower and his wife Mamie. It is also on the National Register of Historic Places. The Wyoming House is certainly not alone when it comes to grand old buildings in the vicinity that have been restored and converted to luxury condos for sale. Others include The Dresden, The Carthage, 2029 Connecticut, 2101 Connecticut and St. Nicholas. Built in three stages between 1905 and 1910, the Wyoming was designed by architect B. Stanley Simmons. The central entrance and lobby, bridging two seven-story towers, was part of the final stage of construction. Said lobby presents itself spectacularly with marble walls, pillars and 15-foot ceilings embellished by an elaborate pattern of floral plaster detail. The floor is made up of one-inch colored marble mosaic tiles. This beautiful complex was converted to condos for sale in 1983, with loving restoration work. There are 105 residences in an unusually wide range of sizes, from 550 to 3000 square feet! The price range is also quite varied, from the high $300s to well over a million dollars. Units at the Wyoming have traditional floor plans, often with long foyers leading into the living area, along with formal dining rooms and in many cases, dens. The hardwood floors have been lovingly preserved, as have other original details. There are large windows, thick crown molding and abundant closet space. The kitchens have been updated as well, some to a more modern extent than others. Residents will also enjoy a 24 hour front desk, a children’s playground, a delightful garden and a new roof deck with panoramic views. There’s also extra storage, a bike room, an in-house building engineer, a woodshop and a photographic darkroom. Those are some old school amenities! And then there’s the neighborhood, or if you prefer—neighborhoods plural. Residents at the Wyoming can walk to all sorts of great stuff, from the Kalorama triangular park to the massive Rock Creek Park with its many hiking and biking trails. Plus all the great shops, bars and restaurants along nearby 18th Street. This is just a great place to live.